This ram lamb and his twin sister have style to spare! Dam is Woolly Hollow 0701. Both are RR. Our oldest Tunis lamb, shown with his dam Maag 28. He is RR. This ewe and her brother are out of Woolly Hollow 0602. We are really excited about how these "Target" lambs are looking! They will all be QR or better. We will not be consigning to the National Tunis Sale this year, so at this time these ram and ewe lambs are only for sale at the farm. Check the For Sale page after April 1 for more pictures and information about which ones will be for sale. 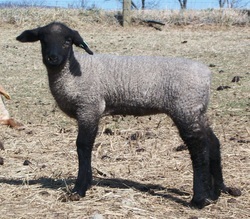 This "Cartoon" lamb is out of Shell 810-09, the ewe we purchased from Dan Shell at the 2009 Stars of Louisville Sale. 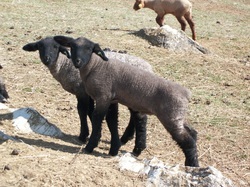 110 and 111 (not pictured) are a pair of stylish Shell ram lambs out of a home bred ewe. Another "Cartoon" lamb, whose dam goes back to a Hope ewe. This ewe will probably stay in our keeper pen. She is QR. The ram lamb on the left is 0100, a twin born 1/26. He carries the thick pattern typical of our Shell sired lambs. The ewe lamb is 0120, a QR single born 2/2. She is looking like a keeper at this point. 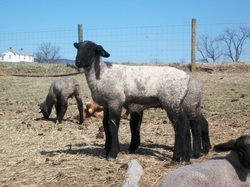 We will have Hamp ewe lambs for sale at the farm, and we may have a limited number of ram lambs as well. These lambs have not yet been Codon tested, and we will only offer lambs that are at least QR. Check our For Sale page in a few weeks for more information.